Damage recharges for defleeted contract hire vehicles reached record levels in 2017, with a higher percentage of cars incurring charges compared with last year. Both cars and vans incur a higher average recharge than in 2016, and while the percentage of vans recharged remained static, the proportion of cars facing fees increased by three percentage points. The issue of end-of-contract charges is a sensitive one between leasing companies and their customers, with some accusations that recharges are higher than they should be. The charges are intended either to carry out refurbishment to bring up the value of the vehicle to the expected level at remarketing, or more likely to compensate for a reduction in the value of the vehicle because of its poorer condition than anticipated at the end of the contract. The average recharge for excess wear and tear on a car in 2017 has broken the £300 barrier for the first time at £307, significantly higher than the £289 recorded in 2016. Figures for average recharges among FN50 companies vary from £48 to £525 per car, with a number of companies reporting at the higher end of the scale highlighting a potentially sharp rise in costs for many fleets. However, the highest average charge for company cars in 2017 was a little lower than the £540 reported in 2016. Excess wear and tear has long been a point of discussion among fleet operators and contract hire providers, with the British Vehicle Rental and Leasing Association (BVRLA) Fair Wear and Tear Guides forming the basis of what is acceptable at the end of a lease, and what should incur extra charges. The organisation produces three guides: cars, LCVs and HGVs have their own individual booklets, available as hard copies or in digital formats. The latter, which can be licensed by BVRLA members to their customers, perhaps offers greater convenience for many. Likewise, procedures and technology have evolved in recent years, to help company car drivers and their employers understand better what would likely result in recharges in the weeks leading up to the end of a contract, giving them the choice of taking action to help reduce the bill, or at least managing expectations. Smartphone cameras and apps have been able to speed up the communication process, improve transparency between all parties, and reduce the risk of unpleasant surprises when the vehicle is returned. Contract hire companies are also keen to work with fleet operator customers to help them maintain vehicles in an acceptable condition, and ensure the end-of-contract process is as smooth as possible. The average percentage of cars on which recharges were made has crept up in 2017 to 37%, compared with 34% in 2016, although still lower than the 38% recorded in 2015, and has been as high as 43% in 2009. The average number of cars incurring recharges in 2017 varies from 5% to 80%, with seven contract hire companies reporting a rate of 50% or higher. The upper level is significantly higher than the 61% reported in 2016. Only five companies reported a proportion of cars subject to recharges at 20% or lower in 2017. The average damage waiver for cars was the same as in 2016 at £170, which is £10 higher than the first year the data was recorded in the FN50 survey in 2015. The damage waiver figures for cars range from £50 to £250 – slightly less generous than for that of vans. Vans usually have a tougher life on a fleet than company cars, often with higher mileage, and with goods repeatedly loaded into and unloaded from the cargo compartment. It is likely that the showroom condition of a van would deteriorate more rapidly over a few years on a fleet than a company car, although the BVRLA’s Fair Wear and Tear Guide for LCVs aims to take this into account. In 2017, the average recharge for end-of-contract vans has spiked, reaching £416 – £32 higher than the average in 2016, and £27 higher than when separate figures for vans were first reported in 2015. The lowest average recharge reported for vans was £48, with the highest at an eye-watering £1,200 – although this was from a proportion of 5% of vans incurring recharges. Seven companies in the FN50 reported an average recharge for vans at £500 or higher, with seven reporting figures at £250 or lower. 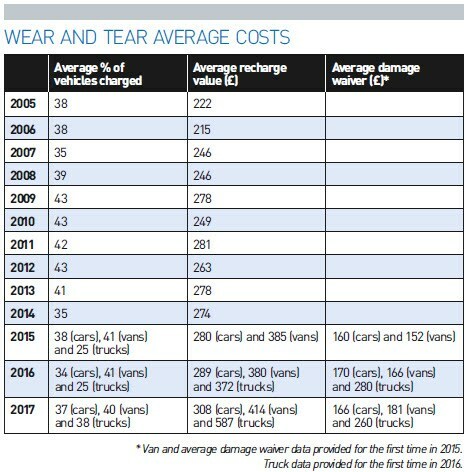 Four of the companies reporting average recharges in excess of £500 per vehicle also recorded excess wear-and-tear damage on more than 50% of the vans. This level of recharge on a wide scale would be bad news for fleet operators, and ought to prompt a review of end-of-contract procedures, as well as working with van drivers to agree acceptable levels of damage through wear and tear. If damage is caused through accidents while driving, it could be prudent for the customer to invest in training, or in-cab CCTV to help guard against false claims, with the cost offset by lower recharges at defleeting. 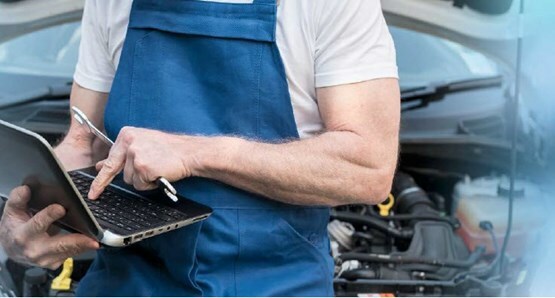 Fleets will be aware of most of the options available to them to help maintain vehicles in a better condition, but it might take a significant recharge bill to wake them up to the need. The average percentage of vans incurring recharge costs was 41%, the same as in 2016, and slightly lower than the 44% recorded in 2015. The average damage waiver for vans in 2017 was £188, with one contract hire company offering just £75, while the most generous figure reported was £300. As the cost of vehicles is expected to increase – partly through exchange rate issues, but also increasing safety technology content, with further safety and convenience features available as options – fleet operators can ill afford to leave themselves exposed to higher charges at the end of a lease. It is in their interests to take actions that minimise the chances of unexpected costs, especially as the economy is facing additional challenges in the coming years. And while leasing companies seek to cover their own costs when a vehicle with excess damage is defleeted, they consistently say they would prefer not to have any vehicles returned with excess wear and tear at all, despite some accusations from customers of taking a harder line than necessary. Most predictions point to reduced new vehicle registrations in the coming years as the drawn out negotiating process over Brexit results in uncertainty over investment decisions, and new vehicle purchases are cancelled or deferred. There are predictions of lower growth than expected in 2018, and some of the more pessimistic forecasts also point to the risk of recession if the UK withdraws from the European Union with no trade deal in place. The last time the UK was in recession, the FN50 reported the highest proportions of vehicles subject to excess wear-and-tear charges, with 43% in 2009 and 2010. Accusations that contract hire companies were keener to recoup profit lost from fewer new car registrations were at their loudest during this period. It will be interesting to monitor the developing situation to see if this pattern re-emerges, and if it does, whether noise around recharges will increase. In these circumstances, customers could be less inclined to accept the argument that contract hire companies prefer fair wear and tear condition vehicles at the end of their fleet lifecycles.